Known for providing cutting edge technology, service and innovation to the local food industry, B.T. Enterprises has long recognised the advantages of using Apex General Purpose Strip Curtains at its facilities. Established in 1974 as a supplier of specialised food processing equipment, the company has grown to where today it operates three divisions – food processing equipment, packaging materials and spices and food ingredients. Wim Dessing Jnr, sales director at Apex Strip Curtains & Doors, says the company has a large number of repeat customers, and counts B.T. Enterprises among these. “Operating in the food industry requires high level of quality control and this includes eliminating the ingress of dust, insects and other foreign contaminants from its packaging, blending and processing areas,” Dessing Jnr says. Apex General Purpose Strip Curtains are installed in a number of locations at B.T. Enterprises’ facilities and with individual strips being reinforced with the patented Balledge® have proved durable. This unique edge ensures an efficient thermal seal yet allows strip to part easily under pressure to allow personnel to move between areas. In the latest installation as B.T. Enterprises, a fixed Apex General Purpose Strip Curtain installation was replaced with an installation on a specially designed sliding track. Dessing Jnr says this facilitates a much wider opening allowing bulk palleted goods to be easily moved in and out, increasing productivity. Another requirement in this particular application was the inclusion of a red strip in strategic positions among the other clear strips. These cautionary strips clearly demarcate the sides and the middle of the opening, further enhancing safety for those moving through the opening. 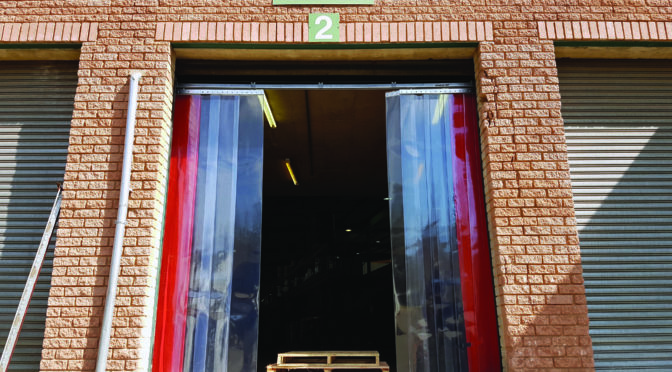 Apex General Purpose Strip Curtains are locally manufactured by the company in Johannesburg, and its technical team is able to assess applications and provide a fit-for-purpose cost effective solution.